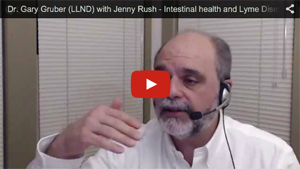 Jenny Rush hosts these FREE teleconference calls and video chats. The calls are on hiatus for the moment, but all recordings remain available. These calls were originally created by Jenny Rush and Lisa Hilton to give people an opportunity to deal with the spiritual/emotional component of illness, something that deserves as much attention as the physical component, and is the aspect that gives a person the most power in their healing journey. A different topic is picked for each discussion. Guest speakers are also scheduled who share their area of expertise, offer hints, techniques and information that people can then use themselves. There is always an opportunity to ask questions during the the calls. If you are looking for the next scheduled phone call, it will be posted here and on the Lymethriving page on Facebook. If you are on the mailing list, you will receive the Teleconference event reminder by email. In case you have apprehension about being on the call, the space provided is loving and non-judgmental. We have laughter, sometimes a few tears, but mostly it’s just a relaxed conversation. Calls are recorded and links to the recordings can be found below each call listed on this page. Please note that these teleconferences are recorded. November 7th, 2016 – Identity Lost to Illness? Rediscover You! Feb 8th, 2016 – Who Am I? Aug 17th, 2015 – Newly diagnosed with Lyme? Not sure which way to turn or where to start? Begin here! March 31st, 2014 – Success Stories! -Chronically ill friends – I know you. I believe you. I understand. Links to a large variety of topics from the call were posted onto the Facebook event page. Deepening the conversation on beliefs, what they are, and how they limit us and keep us in a pattern of illness. We will look at beliefs, what they are, and how they limit us and keep us in a pattern of illness. May 23rd, 2016 – Dr. Gary Gruber, LLND joins us to talk about “HEALING, GETTING BACK TO BASICS”. October 21st, 2015 – Raphael Kellman, MD (Internal Medicine – Lyme and chronic illnesses) will discuss what the microbiome is, how it relates to Lyme Disease, and practical suggestions for dealing with chronic illness. Sept 17th, 2014 – Jenny Rush, Angela Dumas and Jenna Wright hosting. The topic is dealing with loss in a chronic illness community. Aug 20th, 2014 – Jenna Wright is our guest speaker. Simplifying your food life! July 28th, 2014 – Jenny Rush and Lisa Hilton welcome Jenna Wright to recap a the variety of treatment protocols that have been addressed recently and will pull them into an overall holistic approach. Feb 3rd, 2014 – Understanding the Law of Attraction to empower you on a path to well-being and wellness. Hosted by Jenny Rush and Angela Dumas. 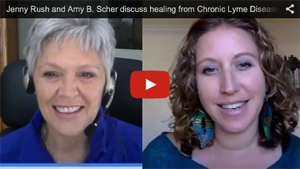 Amy shares her experience through Lyme and co-infections that led her to India in search of health, but ultimately led her on a journey into a deeper understanding of who she truly is and the deep healing that resulted. The story behind Lymethriving with Jenny answering the most frequently asked questions about her illness experience.